This is one of the most common questions I receive and it is quite normal since when you get an unsuccessful strike, you start to wonder why this happened. And then you believe that if you had two assist hooks instead of one, you might have double chances to get that nasty fish. Well you are not far from the truth and this is what we are about to see now. 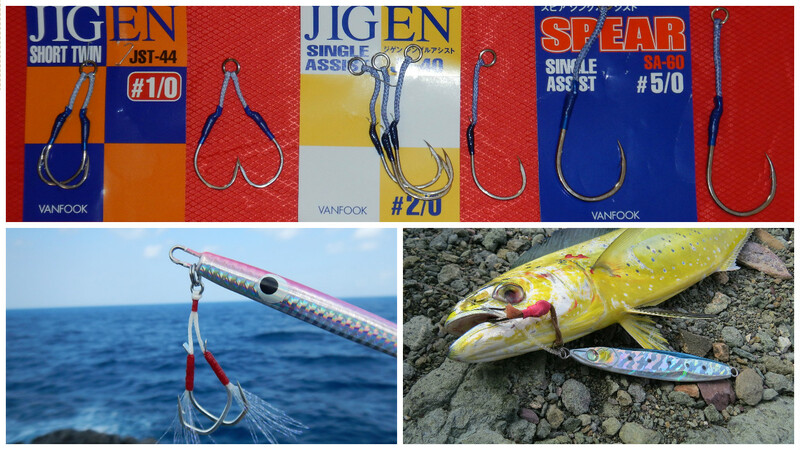 Top: Three types of assist hooks. Two light assist hooks on one solid ring, single light assist hooks, and single large assist hook. Bottom left: Double assist hooks dressed. Bottom right: Large custom assist hook. Normally one assist hook can be used both for bigger and smaller targets and also it can be used in two situations. The first option is to use a big assist hook with a curve much wider than the width of the jig. This combination is targeting mostly bigger fish with large mouth like groupers, Amberjacks, leerfish etc. Those fish normally attack and gulp the whole jig so the single large assist hook for sure will have a good chance to hook on the interior of the mouth and the wide curve helps a lot for succeeding this. The other option is to use a single assist hook on short jigs that the width of the hook is equal, slightly wider, or even narrower that the body of the jig. The important thing is not to be able to snag on the jig body and move freely at all times. A wide and big single assist hook serves us better when we deal with big fish. 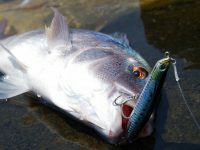 The thick and strong body of the hook guarantees a deep secure hold on the flesh or even jaws of the predator’s mouth or body. This allow us to pull hard with the drags set in very high power and even stop a big grouper from run to a cave. The unfortunate thing is that if the single assist hook snags on a rock, is almost impossible to leave it and because of the big size, wide curve and much weight, it is a master on snagging on the bottom. As I have mention in other articles, the more heavy a hook is, the more fast and “aggressive” it tends to hang from the sides of the jig, when this lies on the sea floor. 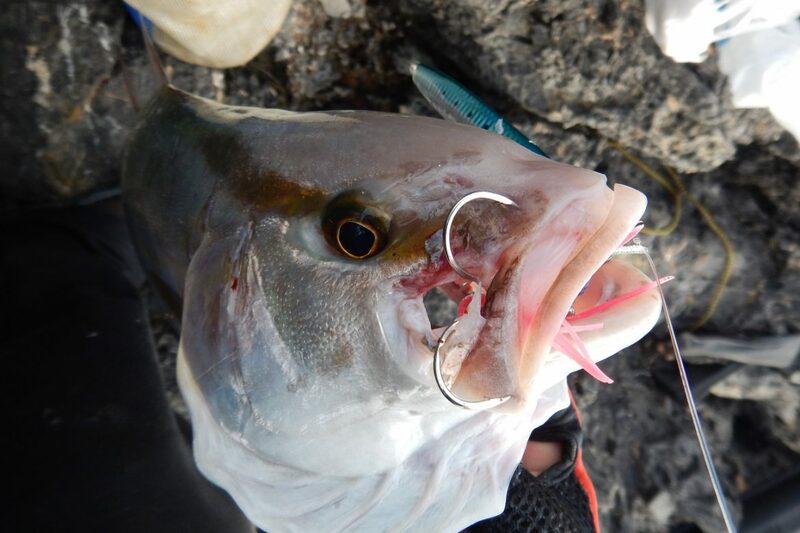 A secondary issue is that the more heavy a hook is, the harder it gets to be “inhaled” into the mouth of predators with smaller mouths like snappers, bonitos etc. Typical hook ups with single large assist hooks. Fishing with two assist hooks. For sure two assist hooks doubles the chances of a successful strike. Now don’t ask me if three, triples the success rate because I don’t know and don’t want to know! As I have analyzed on other articles, the more tension we add to the front side of the jig, the more it affects negative the jigs action and three assist hooks is the best way to succeed this. (I only mention this because some of you told me that you already use three assist hooks). Now let’s get back to the point. 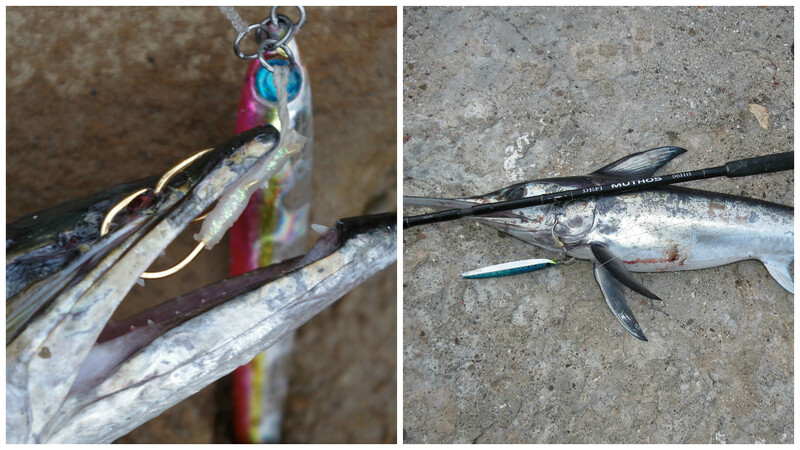 Two assist hooks on a jig can be combined in two ways. The most common way is to use light, thin hooks with a curve equal or slightly wider than the jigs body width. This is the best way for long and slim jigs and normal ones as well. The other option again has to do with short jigs and in this case the assist hooks must be narrower than the jigs body and unable to snag on it! 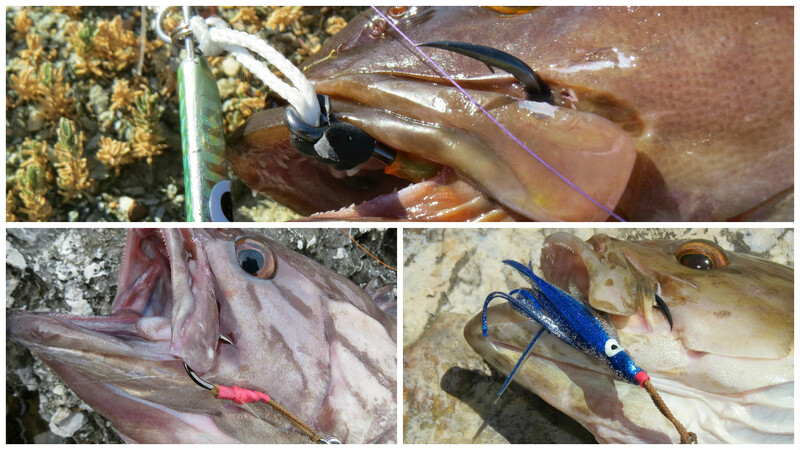 The benefits of using two light and relatively small assist hooks are many. As someone can expect, almost every strike is successful and the landing rate is impressively high because in case that only one assist hook enters the mouth and grabs there, the other one will hook on some other part of the body during fighting. As someone can imagine, the case of the fish to tear and escape is impossible and this also allows us to pull with great tense if needed. 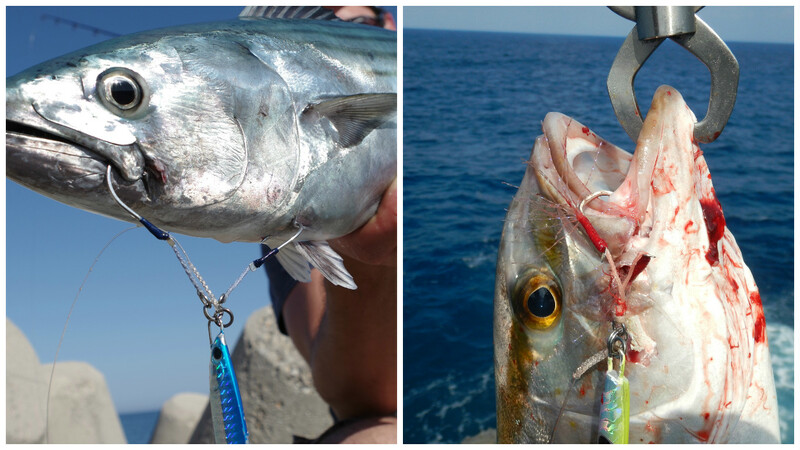 Using two smaller assist hooks is ideal for fish with a smaller mouth like snappers, albacores, bonitos, dorados etc. On the other hand it is very natural to think that two assist hooks are easier to snag on the bottom than one, when the jig rests there after cast. This is partially right. On hard substrate like rocks, light hooks are more difficult to snag if we act fast. I mean that we must be focused on the jigs falling and when it reaches the bottom, we must start jigging. Doing so, we do not allow the hooks to hang much and grab the bottom. One more thing is that a light hook with a less wide curve grabs the bottom less strong and with one or two twitches releases it. You must remember that the lighter a hook is, the harder it grabs on the rocks, if so it easy releases it and the easier it is “inhaled” during strike by the fish. The problem is that if we have double assist hooks and grab a professional long line that lies on the bottom, there is absolutely no chance to release it! Now Double assist hooks are available in the market in two types. As single ones, which means that every assist hook end up on its own solid ring, or double with a single solid ring that has two assist hooks hanging from it. It doesn’t matter which type you will choose, but be careful to choose the right length of the cord which is essential. 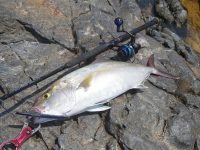 (http://imanangler.com/shore-jigging-the-right-length-of-the-assist-hook/). Typical hook ups with double light assist hooks! 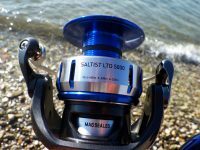 Another option: If you have now single assist hooks of this type and I mean light, narrower with one assist hook per solid ring, another option that is very alluring and promising is to use it single when you have to do with very hard bottom. With this way it is very hard to snag on it, and you still have great opportunities for a secure hook up on the fish. Of course there is a great risk of tearing it and lose it, so you must use your drags with less tension, something that is extremely not advisable in very hard bottoms. Yes this is the world of shore jigging and in none case we can have it all so we must know all the parameters and decide what is the best oprion in each case, without ignoring the risks of it! Left: Typical hook up with double small assist hooks. Right: Random hook up with single small assist hook.